Take a look at Don’s new single-ended 6C33C amp. The top plate is ABS plastic, the wood base is Australian Spotted Gum. There is a power transformer for the HT supply and a toroid for the 6C33C heaters. Two chokes are used to split the HT into two seperate PS channels. This is a three stage amp with 6SL7 driver tubes. The two 6SL7 triodes are linked with a cap but the second triode drives the power tube direct. Each power tube will run up to 220mA but even at 150mA the power tranni gets real hot. Don’s work is ultra neat but I had to correct all the wiring around the 6SL7 for him to get the amp to go. It sounds absolutely fabulous. 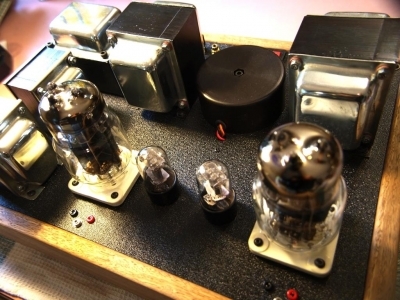 Has to be Don’s best tube amp build to date.